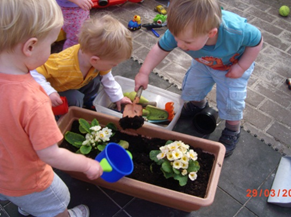 Established in 1986 in Ibstock, Leicestershire, by Janet and Andrew Ward, Holmsdale Manor Nursery, Ibstock, is a superb environment for children. Set in extensive grounds of over 2 acres, in addition to our own woodland, Holmsdale allows children to develop and learn in a safe but exciting location, which offers opportunities for learning that are second to none. We offer high quality child care for babies, toddlers and pre-school children, rated outstanding in all areas by OFSTED, with experienced, highly qualified staff as well as excellent facilities and resources. We believe the quality of provision we offer exceeds anything else available in the area by far. To see comments by parents of children at the nursery click here. In recent years we have received a wide range of national and local awards, quality marks and other recognition for our provision- see the News section of the website for further details. We offer 15 funded hours in pre-school for 3 and 4 year olds. Some children are entitled to an additional 15 hours, totalling 30 per week. This funding is term time only, but we are also happy to provide it as a "stretched offer" across 50 weeks of the year. Some 2 year olds may also be eligible for funded hours. For further details, please contact our office. Our extensive outdoor facilities are unique and offer a wide range of learning experiences. The living willow structures and adventure playground are very popular with the children. We have various vegetable patches, an orchard and a wildlife pond, offering plenty of chances to interact with nature. At Holmsdale, there is a small forest school area, as well as several larger sites in our nearby woods. We have many staff with forest school qualifications, and also offer forest school training for adults. We have a large scale environmental art workshop, an area for woodwork tools, a sound garden and a story garden. On our field area, we have a traversing climbing wall, a trim trail, a log tangle climbing frame, a huge sand pit, a stage, a fairy dell and more! We also have a large paddock for our two donkeys, Hettie and Bullseye, who we have adopted from the Donkey Sanctuary, and their friend Holly, the Shetland pony. The chickens often wander around too! Our two Guinea pigs, Ana and Elsa, live in one of the gardens. To find out more about our facilities, click here or use the menu to the left. Ibstock Nursery School, Holmsdale Manor Nursery. Children from Ibstock and many surrounding villages attend Holmsdale Manor Nursery. Consequently we feed a wide range of local primary schools and have established good links with them. 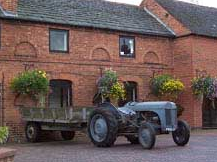 The local villages that Holmsdale Manor Nursery serves include Market Bosworth, Ashby, Congerstone, Twycross, Newton Burgoland, Snarestone, Measham, Barlestone, Desford, Heather, Packington , Ravenstone, Ellistown and Hugglescote. We can offer high quality childcare and education for children whose families live and work in these areas. We offer an ideal environment for children right through their early years as our outdoor and indoor facilities are fantastic. Children are grouped according to age, which means we can provide resources and equipment ideally suited to each stage of development as children progress through our baby room, toddler rooms and into pre-school. Ibstock Nursery School. To find out more about the nursery please click on the menu on the left.